First prepare the sponge cake. Need to preheat the oven to 180 degrees — biscuit dough is prepared quickly, and process manufacturing-baking does not tolerate interruption. In a large bowl sift the flour, add a pinch of salt and baking powder. Then on a small fire heated the butter and milk until, until the butter is melted. In another bowl, beat the eggs and sugar until the formation of strong light foam, the mass is gradually alternately add milk mixture (pre-cooled) and flour. Then whisk biscuit dough to a uniform dense mass and knock it in greased with butter or lined with baking paper removable form, a little sprinkle with flour and put into the oven. The time of baking the dough for about 40-50 minutes. Bake the cake until it is Golden brown and the willingness to check with a wooden stick. While the dough is baked, you need to prepare for him impregnation. This should be milk mix all three together and add the vanilla. Once the sponge cake is ready, remove it from the form and put in a container, which will be slightly wider in diameter. In order to fill future cake impregnation, should pierce it with a knife in many places, add treatment and leave on overnight. In the morning we take out cake, turning it, and cover with the topping. What will be the topping is solely your choice! 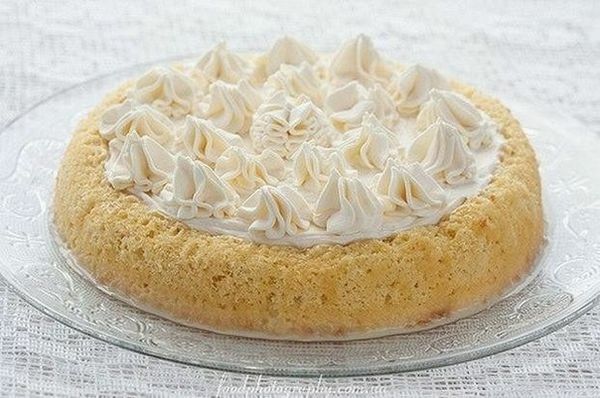 «Three milk» you can decorate condensed milk, different types of glazes, fruit and / or candied fruit and classic for this recipe whipped cream.